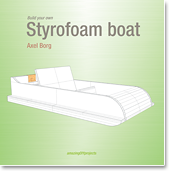 This building instruction covers the build of a glass fiber reinforced expanded polystyrene boat. Lightness and simplicity of construction are key features. The ability to go fast with a moderate size motor and travel over shallow waters are two other important features. First tests with 4hp outboard motor. More fun tests with 4hp outboard motor. First test with electric motor.